The latest news, press releases and information about the best restaurants of the world. 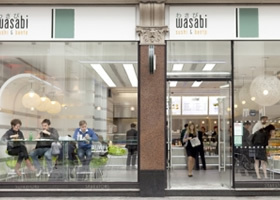 Wasabi, a fast-casual sushi chain based in London, is planning to open its second New York City restaurant in March 2015, the company told Nation’s Restaurant News. The concept opened its first New York City location in Times Square in February. The second will open downtown at 7 World Trade Center. “We’re very, very pleased to have a site in the World Trade Center,” said Wasabi head of facilities Mark Lerego. “It’s a compliment to the gravitas of the company. The company is also in negotiations to open at Manhattan’s downtown Fulton Street subway station, which is currently under renovation, Lerego said. Dong Hyun Kim, a South Korean entrepreneur and former accountant for Samsung, founded Wasabi. Kim got his start in restaurants with a fish-and-chip stand in London’s Camden neighborhood. He expanded with stalls offering chicken, Italian food, Japanese food and other items before borrowing money from his sister to open the first Wasabi location in central London. “Apparently, from day one people were queueing out the door to get the food,” Lerego said. The chain continued to expand over the next 10 years, and now has 38 locations in the United Kingdom, plus the New York unit. The Cheesecake Factory Inc. said Monday it plans to move into Asia for the first time. The Calabasas Hills, Calif.-based casual-dining operator signed an exclusive licensing agreement with Hong Kong-based Maxim’s Caterers Ltd. to develop at least 14 restaurants over the next 10 years in Hong Kong, Macau, Taiwan and China, beginning in 2015. The agreement also includes the opportunity to expand to Japan, South Korea, Malaysia, Singapore and Thailand over time. “The agreement with Maxim’s provides an incredible opportunity for us to develop in Asia with an established, multi-unit restaurant operator that has nearly 60 years of operating experience in the region,” David Overton, The Cheesecake Factory Inc.’s chairman and chief executive, said in a statement. In addition to Asian and European restaurant brands, Maxim’s Caterers is a licensee of Starbucks. The group operates more than 840 outlets of all its brands in Hong Kong and China and four in Vietnam. 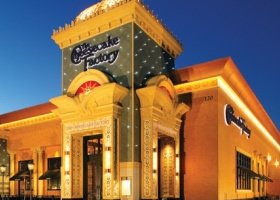 Though founded in 1978, The Cheesecake Factory came relatively late to the international growth game, opening its first overseas location in Dubai in 2012. Since then, company officials have increasingly touted the chain’s growth opportunities outside the U.S.
“International expansion will become an increasingly meaningful driver to achieving our goal of delivering mid-teens earnings per share growth over time as the number of restaurants operated by our licensees gradually increase,” Overton said. The company’s four international units are all in the Middle East. They are among 22 licensed units scheduled to open with Kuwait-based M.H. Alshaya Co. in five countries: the United Arab Emirates, Kuwait, Bahrain, Qatar and Saudi Arabia, and company officials say they are performing well beyond expectations. The Cheesecake Factory also has a licensing agreement for the development of 12 restaurants throughout Mexico and Chile, with the potential to move into Argentina, Brazil, Columbia and Peru. The first restaurant in that region is scheduled to open later this year. The Cheesecake Factory Inc. operates 181 restaurants in the U.S. and Puerto Rico, including 169 under The Cheesecake Factory brand, 11 Grand Lux Café units and one RockSugar Pan Asian Kitchen location.